Wins for Selsey, Sidlesham and Lavant - defeats for Midhust and Bosham. It was a mixed week for our local sides. Here are the latest match reports from around the district. Dave Storey struck late for Bosham but it was in vain as Roffey maintained their push for division-two glory with a narrow victory at Channells Broo. With Bosham looking to prevent league top scorer Devon Fender, from getting on the scoresheet, he did have a sight of goal early on but Kieran Magee made a smart save to keep it 0-0. The Blues’ passing was crisp and direct but Storey was the first to have a chance for the Robins. He went agonisingly close, and the management in the dugout had their heads in their hands. Moments later Fender again had a shot at goal but Magee saved well. Close to the break, Louis Bell drew out a brilliant finger-tip save from Roffey keeper Chris Coles as he fired goalwards from long distance. Both sides continued to try to break the deadlock but the teams went into the interval goalless. After the break Roffey made the charge and goals from Jack Munday and Harri Nourse condemned Bosham to a frustrating defeat. With nearly 79 minutes gone, the Blues edged in front when Munday was found unmarked at the back stick from a corner whipped in by Ben Chowney. Bosham were rocked but came out from the re-start looking for an instant reply – though any chances were snuffed out by the well-drilled Roffey defence. New signing James Roston came on late for the Robins having completed his registration 24 hours earlier from United Services Portsmouth and looked sharp as he joined Storey up front. Roffey upped their game and a swift attack from defence caught Bosham with lack of numbers at the back. Nourse surged into the area and fired home from a very tight angle. 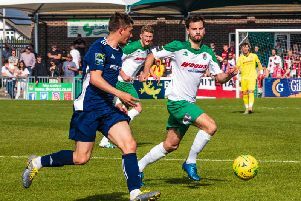 Bosham did respond as the redoubtable Storey used his strength to out-muscle Gavin Fowler and shoot past Coles to give the Robins hope – but the clock was against them and Roffey were able to re-group and see out time to go joint second in the table behind new leaders Cowfold. Bosham travel to Ifield this week hoping to get back to winning ways. BOSHAM: Magee, Redman, Bulbeck, Bryant, Bell, Blanshard, Lafferty, Storey, Dowden, Wilson, Docherty. Subs: Roston, Fewell, Barnes, Probee. In division one of the Southern Combination, Selsey’s improving form continued with an entertaining 5-3 win at home to Langney. Cameron Corell, Joseph Clarke, Ben Mepham, Ryan Morey and James Parsons were their scorers. Sidlesham also won, beat Steyning 3-1 through strikes from John Phillips, Tom Kelly and Joe Jefkins. But Midhurst lost 3-2 at Saltdean despite going two up through Lewis Hamilton and Scott Dormer. Lavant romped to an 11-0 win over basement side Ockley. Lavant had a few first-team regulars missing but the resulting change in shape had spectacular results. There wasn’t much between the sides in the opening 15 minutes, but Lavant opened the scoring, with James Sandford, in fine form of late, accepting a gift from the Ockley defence to slot home. Next Matthew Lyttle dispatched a free-kick hard and low from 25 yards and wrongfooted keeper to double the lead. Lavant capitalised on further poor defending, Sandford bagging his second off of his thigh. This is where the sparring stopped and the game threatened to turn into an actual boxing match as frustrations began to show from the visitors. Things simmered down and Lavant closed off the half with a fourth and Sandford completing his hattrick. Lavant managed to extend their lead to 7-0 in the opening ten minutes of the second half with goals coming from Aaron Hancock, James Brooks and Peter Caveney. There was clearly no way back for the league champions as the game had now descended into a free-for-all for the Lavant attackers. Caveney bagged his second from the spot after Sandford was climbed on in the box. Ash Hawkes entered the fray and took only a few minutes to get in on the act, scoring his first goal for the club. Hancock got his second with a curling effort from the edge of the area before Hawkes got his second, firing into the roof of the net from 12 yards. It was a superb attacking performance by Lavant with some of the build-up play a joy to watch – and the icing on the cake was a clean sheet, the first for keeper Ash Court this season. LAVANT: Court, Lyttle, Augustus, Wright, Brooks, Mclaren, Harvey, Caveney, Hancock, Sandford, Baker. Subs: Hawkes, Eastwood.